What is the effect of Vinegar for Type 2 Diabetics? Moreover, vinegar has shown hypoglycemic effects as metformin or acarbose by suppressing the activity of disaccharidase and increasing the concentrations of glucose-6-phosphate in skeletal muscle. Therefore, if vinegar is taken at bedtime, the morning blood glucose levels in type 2 diabetics can be lower. Many mechanisms are suggested to describe the hypoglycemic activity of acetic acid. By the way, the acetic acid is the active component of vinegar. One of them include slowly digesting the starch and/or the slow emptiness of the stomach. Overall, the mechanisms include the impaired glycolysis (the process of making the glucose) and enhanced the glycogen-synthesis (the process of depositing glucose in the liver or muscles). The outcomes include reduced fasting blood sugar levels, lowered A1C levels. Now, this is too scientific for you to understand and I do not want to make you more confused. However, I just wanted to share what the studies have shown regarding the use of vinegar in diabetics. The question is: Should we be happy with the results? The problem with these results is that the majority of these trials have been conducted in patients who have also received drug treatment. Therefore, these actions are not really defined to vinegar itself. Now, I personally, believe in natural solutions. There is a rule for them to work: Make them all a habit. In other words, nothing works if you choose it as the only alternative for you. So, if you think to use only vinegar to lower your blood sugar, I think it will not work. 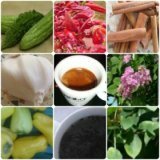 If you choose vinegar and other natural solutions (herbs, lifestyle, diet, etc.) altogether; I am sure you will have the results you want. So, the final word is "DETERMINATION". Nothing works better than a strong willing and being highly determined to control type 2 diabetes. What is the difference between glycemic index of red wine and vinegar? Comments for Effect of Vinegar on Type 2 Diabetes? people keep saying how much weight they have lost since taking these pills' what if you do not want to, or do not need to lose weight - I am at my right weight. Other wise sounds good. The dietary fibers from the skins and seeds of the original fruits or Juices used to make the vinegar is helpful in controlling glucose levels in the blood.